Dr. Handley recommends two dental cleanings per year so that a hygienist can remove any tartar build-up on your teeth and check for cavities. Tartar is the cement-like substance that starts out as sticky plaque, and it can only be removed in a dental office. 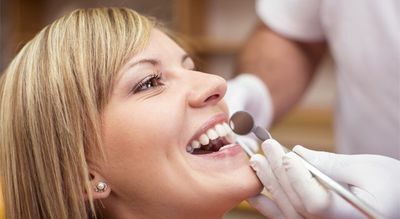 Beyond simple cleanings, Dr. Handley also provides tooth-coloured fillings and dentures. If you’re missing one or more consecutive teeth, we can replace them with artificial teeth affixed to the natural teeth on either side. We also provide crowns when you need a broken or weak tooth restored. Dr. Handley welcomes patients of all ages, including children. We treat our pediatric patients with special care, making sure the visit is friendly, comfortable and upbeat. Call for an appointment today! I have been going to Cheryl for the past 13 years and even though I moved away, I still drive 2 hours to see her. She does not recommend unnecessary work, does not overcharge and even though she's busy, will take the time to answer questions. She was rated as an excellent dentist in Reader's Digest a few years ago and has always given me exceptional service. Dr. Cheryl Handley provides general and cosmetic dentistry for the whole family.